Today’s post in the Fit and Active September series is about finding workout clothes for big busts, shoulders and hips – focusing on tanks, tops and t’s. Since I live in a warm climate, I can wear tank tops across seasons. A huge benefit of tank tops is that I only have to worry about fitting my big bust and hips, because a tank will fit shoulders of varying widths. However, tanks aren’t without challenges because of the “waist-roll” (when the the hip area of a tank isn’t contoured to fit over your hips, and every movement turns the tank into a rolling band of elastic that comes to rest somewhere around your waist or under your bra band). Short and long sleeved tops can be problematic because in addition to fitting a big bust and wide hips, the additional wide shoulder challenge is added. While athletic apparel is generally designed to accommodate muscular shoulders, finding a brand that consistently designs for wide shoulders, big busts, and wide hips has been difficult. Under Armour is my go-to brand for workout clothes for big busts, hips and shoulders. First, they design their women’s sizes for hourglass figures of all sizes (that means they fit my bust, waist and hips). Second, they have a huge selection of styles. Third, there is an Under Armour factory outlet in the Phoenix Premium Outlet center – close enough to hit the sale racks every few months. Women’s Under Armour Victory Tank. Image from UnderArmour.com. 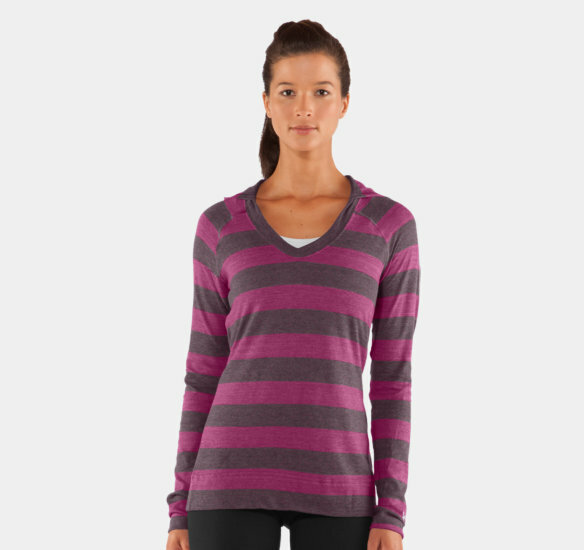 Women’s Under Armour Sedona Hoodie. Image from Rockymountaintrail.com. I’m a fan of convenience, and discount retailer Target is definitely convenient. I’ve found C9 by Champion basic workout t’s to be a great fit for my shoulders and big bust, and they glide easily over my hips. C9 by Champion® Womens Short-Sleeve Power Workout Tee. Image from Target.com. Another great line of workout clothes for big busts, hips and shoulders is Amoena. I recently tried an Amoena Comfort+ Tank Top 13 at local lingerie shop Alice Rae, and I really liked it. The Amoena tanks are discreetly designed with an integrated pocket bra for breast forms, which I didn’t realize until I looked up the design details. 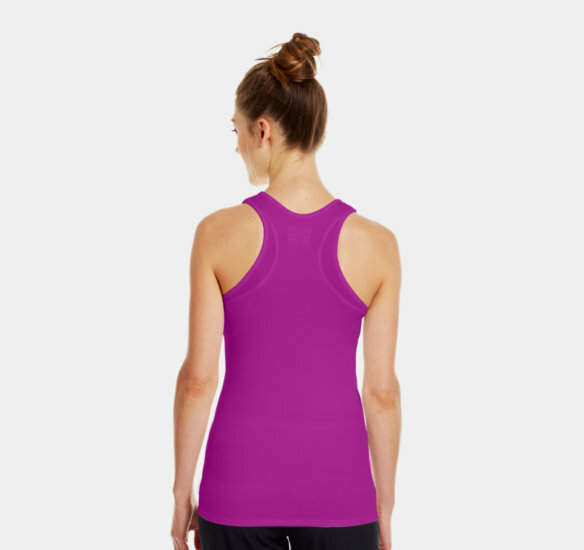 The built-in bra is very supportive, the straps are adjustable, and I could easily go without a sports bra in this top during a stretching or yoga session. The tank is designed to flow over your curves while accentuating your figure – your waist is well defined! Tank Top 13 Comfort+ Pink/Grey from Amoena. Image from Amoena.com. Tank Top 13 Comfort+ Turquoise/Grey from Amoena. Image from Amoena.com. Other brands I’m interested in trying are The North Face and Columbia, since both lines are designed to accommodate hourglass figures. I have my eye on The North Face’s Eat My Dust Sport Tank, and Columbia’s Trail Dash Tank. Columbia Trail Dash Tank from Columbia.com. Image from Columbia.com. Women’s Eat My Dust Sport Tank from TheNorthFace.com. Image from TheNorthFace.com. Losing Weight Post-Partum: akin to Climbing Mt. Everest? I tried it on at Alice Rae, and I fit best in an XL. It may be worth a stop to try it on to see how it fits. It’s not the bra style, it’s your bra band tension!